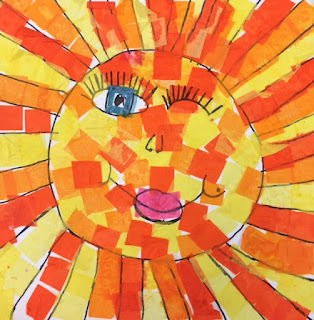 A visit to the Sacred Hearts Academy lower school Art Cabinet display of "Warm & Cool Suns" is the perfect way to brighten your day! The 2nd Grade colorful sun mosaic art project explored different ways of drawing a sun. Students then turned they’re drawings into a mosaic by painting watered down glue onto alternating colored tissue paper focusing on "warm" and "cool" colors.